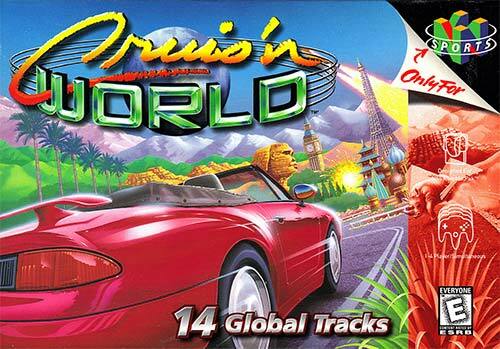 Cruis'n World was released for the Arcade in 1996, then later for the Nintendo 64 in 1998; the sequel to Cruis'n USA. This game was developed by Midway Games for the arcade version and Eurocom for the Nintendo 64 version. This game is published by Nintendo and Midway Games. The race starts in Hawaii and ends in Florida. The object in this game is to outrun nine different cars in fourteen different tracks; this time the new stunt system was introduced to gain time to finish the race. In the Nintendo 64 version when you first play the game most of the levels and tracks are unlocked. Along the way you will unlock new cars and stages and allow new paint jobs. New courses and cars are only in the Nintendo 64 version. For 1-4 players.